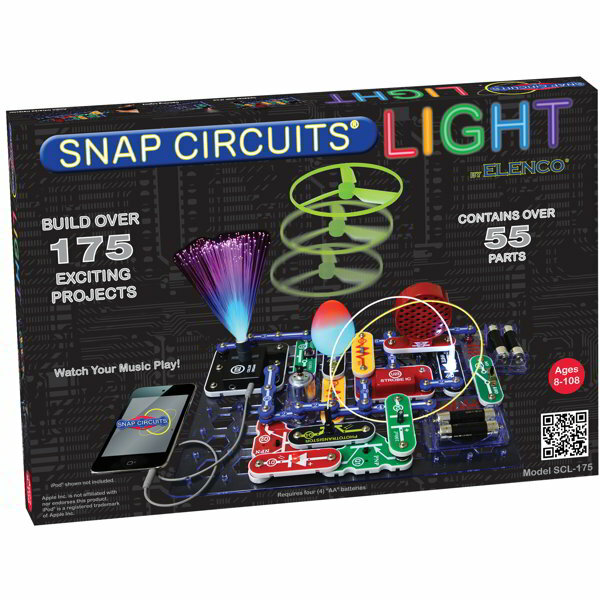 The Snap Circuits LIGHT kit provides hours of educational fun building a variety of electronic light projects. Snap Circuits electronic playsets feature components that are mounted onto plastic modules for easy snap together assembly. This set comes with over 55 parts with instructions for building more than 175 exciting projects. Projects include a music controlled colored light organ, strobe light with spinning patterns and fiber optic communications. 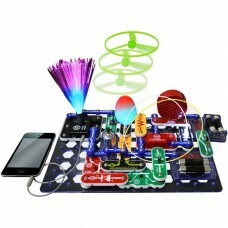 Components include resistors, capacitors, transistors, LEDs, speaker, microphone, motor, easy access integrated circuits and more. A detailed assembly manual provides an overview of the various parts and shows how to build 182 projects. Recommended for ages 8 and up. Requires four AA batteries.